The shift from winter to spring can always be tricky when it comes to your wardrobe. One of my favorite ways to handle the awkward transition is to pair a bright piece with a richer hue in the same color family, like this celery + emerald combo (which also happens to be quite festive for the upcoming holiday). This blouse, from new-to-me designer Zamrie, is lightweight & ideal for layering under a blazer or sweater/sweatshirt for now, but will be perfect on its own & tucked into a pencil skirt later. Zamrie is graciously offering a 50% discount to PPF readers – good for any item on the site! I’m loving this kimono-sleeve blouse & this flowing print top – just use code ‘Pennies’ (case sensitive) at checkout to get half off your purchase through March 25th. That's a pretty good discount! Going to check them out. I love that emerald blazer, been crushing for the color lately. Love this combination! I never would have thought of pairing these 2 greens together! Beautiful look today. You are ready for spring and St. Patty's Day. I like that you added the bow. If you get a sec, check out my latest post 'Channeling Audrey'. I would love to hear what you think of this outfit. What a beautiful look! That blazer is a gorgeous shade of green and looooove those shoes! What an awesome color combo, and I love the bow!! You look so pretty in this green color! I really love your penchant for dressier shoes, they always kick your outfits up a notch! A lovely look & a generous discount…happy shopping everyone! Thank you for reminding me that I need to find a cute green outfit for St. Patty's Day! I can't believe it's already here! Such a pretty blouse! LOVE those heels girl! I love this color combination – the celery really adds a lightness that is perfect for transition weather! I love the rich green shade of the blazer….& that ribbon on the top is like icing…so pretty!!! Blouses with bows are my favorite. The pastel color of this one is so pretty! Always amazing look! I love the shirt!Peace Kisses and love!! Have a fun!Do you want to follow eachother? Love this look! All the green is perfect for St. Patty's day. Thanks for posting the coupon code I might have to use it! 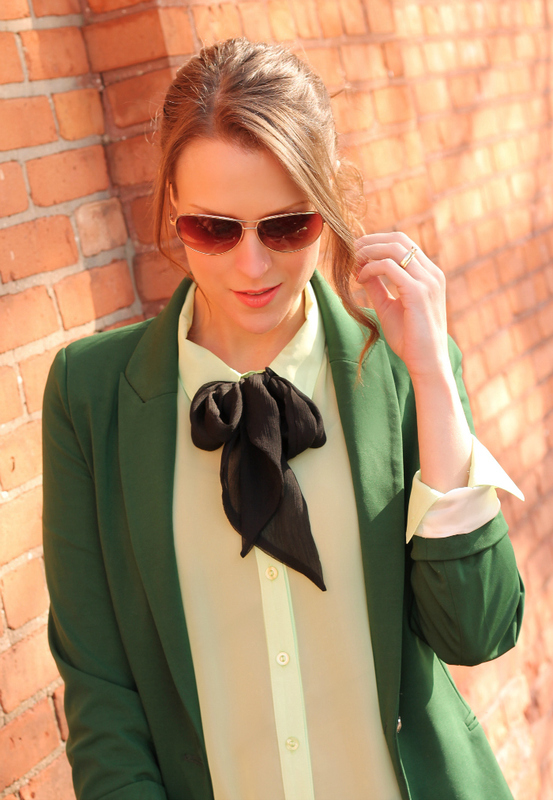 I love that black bow blouse paired with the green jacket…fabulous look!! I love the green blazer! I currently am on the search for a new colored blazer and I have narrowed it down to either purple or green :). Loving the light green and emerald together 🙂 So pretty and springy! That's my favorite way to tie a scarf! And yes, this is perfect for the upcoming festivities! Love the bow at your collar! Love the blouse- going to check out their website! Love the mix of greens! Thanks for the discount! I definitely have a huge color crush here – love that blouse! Great outfit idea for this weekend…green looks great on you btw! Love the different shades of green! Absolutely beautiful! love the color scheme! It's definitely hard to dress during this transition stage – not really winter anymore but not yet warm enough to call it spring. Love your blouse! Green, black, and white is a gorgeous combination. This outfit is definitely a great St. Patrick's Day inspiration. I really LOVE the emerald/celery combo. I don't have anything in a celery shade in my wardrobe, but I love that it's such a soft color. I'll definitely be on the look out for something in that pretty hue. Love your look! I must have a green tailored jacket somewhere. I love that blazer Kim! Green looks so good on you! So polished ans chic and I love the bow! Love the look! What a great discount too, thanks for sharing! Love this! 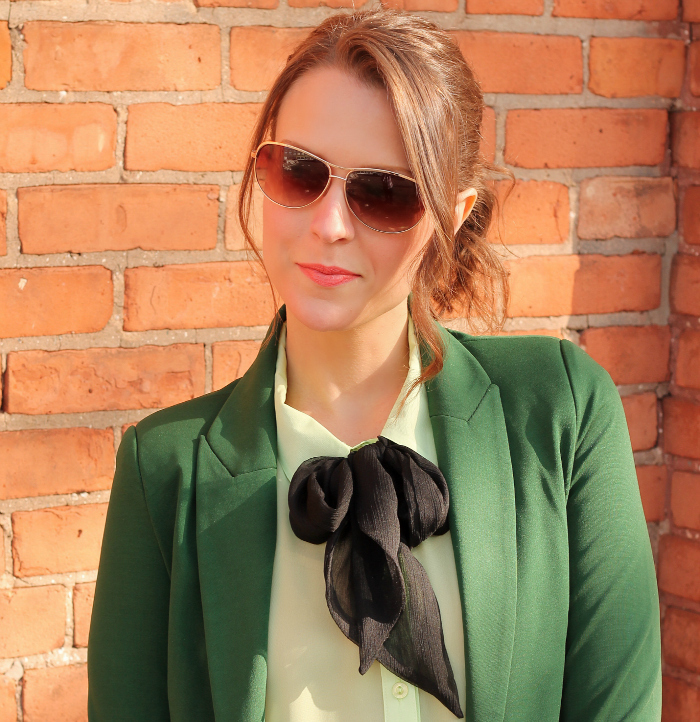 That green blazer is amaze! Fabulous outfit. you look great!! loving the shirt most of all.